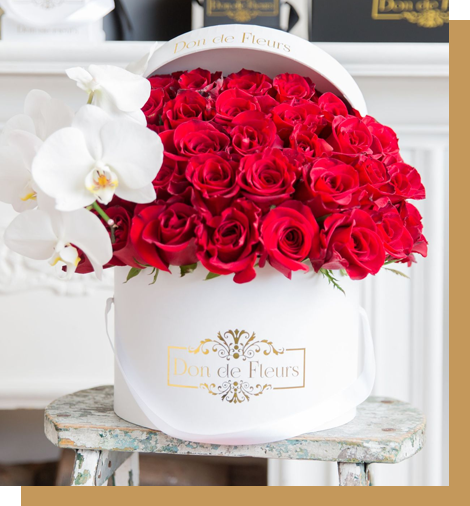 At Don de Fleurs®, presentation and delivery is key! As a premier Miami florist, we bring a unique style of luxury and elegance by providing superior floral arrangements for any occasion and all your flowers Miami delivery services. We are considered to be one of the best Miami florist in South Florida, with the freshest flowers Miami delivery services has to offer. Our luxurious flowers Miami delivery service can send the freshest flowers, designed by a talented friendly Miami florist. Whether you're looking to send an anniversary, get well, just because flower arrangement, Mother's Day flowers, seasonal centerpiece for the holidays or something that says "I love you", Don de Fleurs is the leading flower boutique in Miami, FL and will make sure to send quality long lasting flowers in our exclusive stunning luxurious box. Surprise your loved ones with a unique one-of-a-kind boxed flower arrangement, designed and handcrafted with fresh flowers Miami and hand delivered for any special occasion. Looking to make Valentine's Day, Unforgettable? Well look no further because this is our specialty. Let Don de Fleurs® help you design a special luxurious flower arrangement that will surprise your valentine date. We can help show the one you love (or the one you’ve got your eye on) just how much you care with our romantic custom arranged boxed flower arrangement. From the moment you choose a unique style flower arrangement from our luxe collection, our talented Miami florist designers will work with you to create a beautiful and eye-catching luxurious boxed flower arrangement that's custom tailored with your recipient in mind. Every flower arrangement is handcrafted and personally hand delivered with the ultimate sophistication. As a Miami florist, we use only the best flowers Miami has to offer and provide same day flowers Miami delivery and proudly serve other surrounding areas in South Florida. We are confident that the Don de Fleurs® new luxury floral experience will create lasting memories to each and every recipient. We take special care in selecting the best quality roses and florals available for your arrangement in order to make a lasting impression. Our deep-rooted passion for flowers, along with our dedication to service, makes us an ideal choice!